You say you want a revolution? Google's hoping you do -- at least, when it comes to being able to take your cloud-stored data wherever you want. 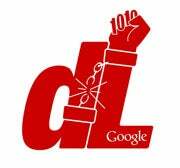 The G-Team has just officially revealed a dramatic-sounding group called the "Data Liberation Front." Translated out of Hollywood-speak, the Data Liberation Front is part of a Google-based movement to let you import and export your personal information from Google's online services without a hassle. And, suffice it to say, the DL (as it's being abbreviated) is no longer being kept on the DL (down-low). 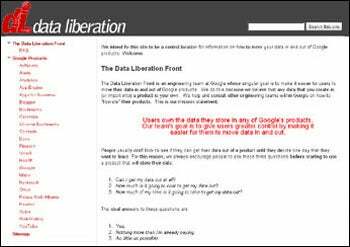 Google started widely promoting its Data Liberation Front Monday, though the group has been in existence for some time. Already, the DL is working to help you "liberate" your data from Google's various products; in fact, numerous Google services are already set up for painless exporting, including Gmail, Blogger, and Google Reader. "Said simply, a liberated product is one which has built-in features that make it easy (and free) to remove your data from the product in the event that you'd like to take it elsewhere," Google Data Liberation Engineering Manager Brian Fitzpatrick explains. Up next, the DL plans to focus on Google Sites and Google Docs, allowing you to grab your info out of the services with a single batch export. It's set up a new Web site and Twitter account to let you keep track of its progress. All right, so what's really at play here? Why is Google making such a big deal out of letting you move your stuff out of its services? As the company explains it, the concept is part of Google's push to create an open Web with open standards. Certainly, Google's moved in that direction before (see: open mobile system, Android vs. anything-but-open mobile system, Apple). But this is a far more pronounced step, with a focus that almost seems to encourage you to pack up and say so long. So what's up? "We think open is better than closed -- not because closed is inherently bad, but because when it's easy for users to leave your product, there's a sense of urgency to improve and innovate in order to keep your users. When your users are locked in, there's a strong temptation to be complacent and focus less on making your product better." "We believe that users, not products, own their data and should be able to quickly and easily take that data out of any product without a hassle. We'd rather have loyal users who use Google products because they're innovative, not because they lock users in." So is Google using this movement to reinforce certain public images, both for itself and for its competitors? Sure. But in doing that, is it also taking a positive step that'll be beneficial to its users? Absolutely. Opening up the Web and allowing us to easily reclaim our data puts the power in our hands. If that means we have to hear some dramatic talk about a Data Liberation Front and how it's fighting the evil rights-slaying dragons -- well, that's one tradeoff that might just be worth our while. Of course, if they start selling DL t-shirts or referring to themselves as a "collective," I may have to reconsider. JR Raphael tries to avoid cults while writing at eSarcasm, his new geek humor site. You can follow his often-odd musings on Twitter: @jr_raphael.